You wouldn’t naturally think that Michael Phelps would have any difficulty setting goals and achieving them. After all, the swimmer from Baltimore is the most decorated Olympian – not just among swimmers, but all athletes – ever. Phelps has won 23 Olympic gold medals, with 13 of them coming in individual events. He holds the record for most gold medals in a single Olympic games – eight – from a legendary performance in Beijing in 2008. A goal he set in the seventh grade, though, might have been his biggest, because it served as the catalyst for a career of achieving amazing goals. As a child, Michael Phelps struggled with attention deficit disorder. His doctor started him on the stimulant Ritalin. While the medication helped him focus in class, he was embarrassed that he had to go to the school nurse every day to take it. He saw Ritalin as a crutch. He wanted to stop taking it. His mother stressed how he struggled to concentrate when he didn’t take Ritalin. She reminded him of his difficulty reading an entire chapter of a book and interrupting teachers by talking to his friends. Phelps was adamant he could thrive off the medicine. “I’ll concentrate harder.” “I know I have to work harder,” he insisted. Phelps recalled how his mother seemed both worried and proud. She understood, though, that this goal was something Michael wanted for himself. She took him to the doctor, and they scheduled a tapering process. By the next school year, he was completely off Ritalin. This goal – getting off a medication that he felt was holding him back – seemed like an enormous obstacle. But he was determined, and he achieved it. “I had learned what it was like to set a goal that was difficult to achieve—and to win,” he explained in his book Beneath the Surface. It should be no surprise then that Phelps has become a model for goal setting and achievement. In his first Olympics in Sydney in 2000, Phelps finished fifth in a race against some of the best swimmers in the world. At practice the next day, his coach, Bob Bowman, wrote “WR Austin” on the workout. They would train to set a world record at the Spring Nationals in Austin the following March. Phelps now had a goal that lit his fire. And yes, he set the world record at that meet. Have you set goals, only to ignore them or decide to quit weeks or months later? Whether your goal is to lose weight, start working out, make more sales calls or become a better public speaker, it’s easy to give up. 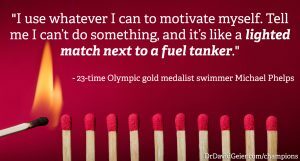 Maybe, like Phelps, you need to prove to yourself that you can do it. Pick one goal. It doesn’t necessarily have to be a mountain-sized obstacle, although that challenge could motivate you. It just has to mean something to you. The beauty of this personal goal-setting process is that once you achieve your meaningful personal goal, it will fuel your fire to accomplish bigger, more daunting goals. I doubt if you had told sixth-grader Michael Phelps he would win 28 Olympic medals that he would have believed you. But after he successfully stopped taking Ritalin the next year, I’m sure he would see the possibilities for himself much clearer. Decide what you want to achieve, and then live and breathe that goal. Decide what you are going to achieve, and then live and breathe that goal. Set reminders on your phone. Put signs on your bathroom mirror. Visualize the joy you will feel when you accomplish it every night before you go to bed. Then take a step toward achieving that goal every single day.